On the Modules List page (Author View), to the right of the module title, there is an action button that is used for setting “Next Steps”. You can set instructions at the end of every module to let students know what they should do after reading through that module. You may direct them to a quiz, assignment, or simply ask them to continue with the next module. Click on Author to go to the Author View page. Click on the green and white round plus icon in the Next Steps column for the module you want to set instructions. Or, if editing existing Next Steps, click on the magnifying glass icon in the same column. Type the steps you want students to follow when finished with a module. Click Add to submit your content and return to Author View. What’s Next? appears at the bottom of the Modules page. 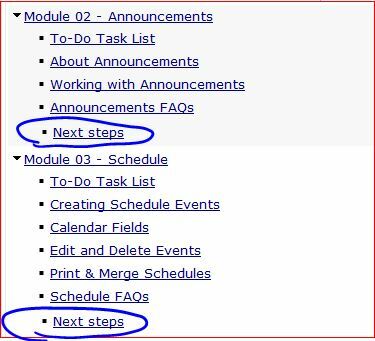 As students navigate through the modules, clicking on “Next” after the last section of a module will display a separate screen with the next steps, if that information was provided by the instructor. 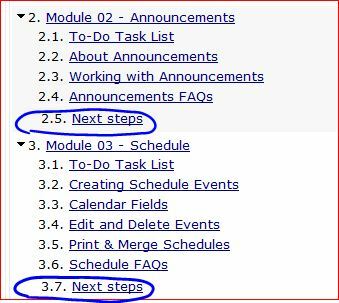 If “Next Steps” are included by authors for modules, a item will be listed as the last section of the module in the table of contents (instructor’s and students’ module list views). If you have enabled auto-numbering under Manage, the next steps will be numbered accordingly.